Michael Singer Studio was responsible for leading the architectural and landscape design for Whole Foods Market Jacksonville at the Mandarin Landing Shopping Center. A courtyard was designed along the northwest corner and the north façade of the market as an extension of the indoor café. The large curving canopy awning that protects the store entry wraps the building to shelter the outdoor café seating and garden area. The metal awning is punctured with skylights and structural steel ladder columns covered with flowering vines. The canopy underside is made from reclaimed Florida cypress (recovered from river bottoms where loggers lost them in the 1800s) and the integrated bench seats associated with the planters are also crafted from reused wood. At the back of the courtyard two 6,000 gallon rainwater harvesting tanks collect rooftop rainwater for use in the café garden and landscaping around the building. 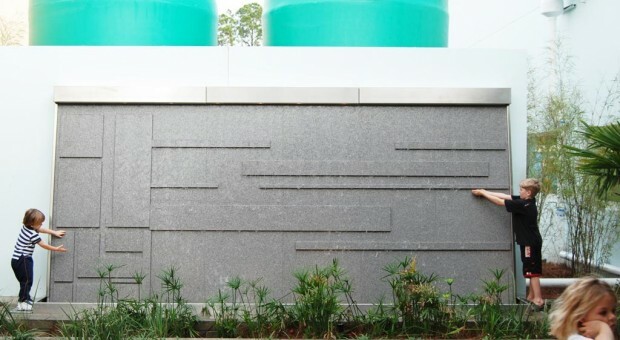 In front of the two tanks the Studio designed a linear granite water wall that introduces the sound of trickling water into the courtyard. The blank wall of an adjacent retail space is covered with greenscreen, vines and plantings to enclose the garden space. The courtyard is paved with a variety of light colored cast-in-place scored concrete with exposed aggregate.